(LWI) - The bells were what appealed to Adam Gnany. As a boy in Baghdad he had watched men tugging a rope to get the bells to ring. Today Gnany lives in Stuttgart. When he slips into the vestry shortly before the Lord’s Prayer he just has to stroke a touchpad and the prayer bell resounds. Gnany is the verger (also known as sacristan) and caretaker of Hospitalkirche (Hospital church), a congregation of the Evangelical Lutheran Church in Württemberg, an LWF member church. 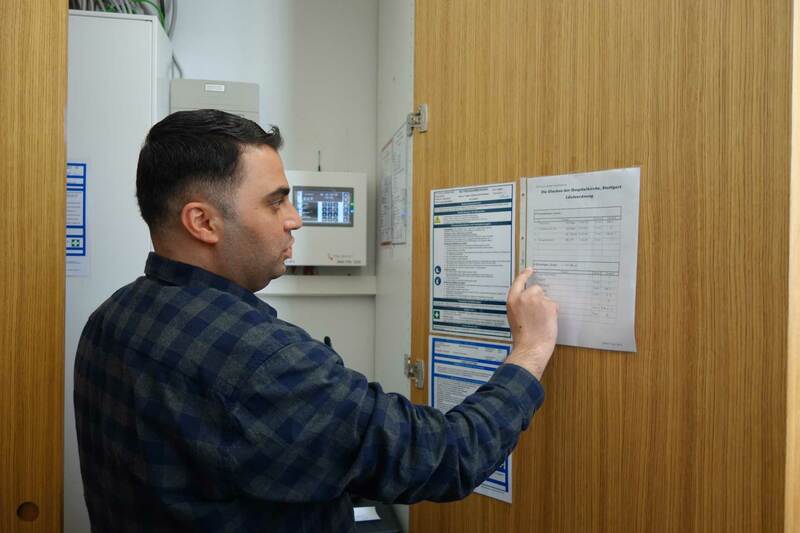 The 26-year-old Iraqi came to Germany as a refugee in November 2015 by bus and train via the Balkan route. As a Christian he had been exposed to hostilities in his home country. The security situation was getting worse and life harder and harder. Finally Gnany escaped to Turkey. His mother and two of his sisters still live in Iraq. After arriving in Germany, Gnany stayed with friends in Mannheim for a few months. After that he moved to Stuttgart. “At first it was not easy because I couldn’t speak German well,” says Gnany, who had studied business management in Iraq and worked at a mechanical engineering company. Due to his lack of German, he dropped out of his first internship at a hotel reception desk. Two months later he got another placement at a Protestant kindergarten. The employment agency finally then referred him to the Hospitalkirche. Last year, extensive renovation were completed and the congregation needed a new verger. This was a great opportunity for Gnany. In the middle of last year, his internship led directly into a secure job as a verger. Gnany has many responsibilities. As one of the three city churches in Stuttgart, the Hospitalkirche is used for lots of church services, concerts and events. Chairs constantly have to be moved around, the chancel has to be prepared for different occasions or flower arrangements have to be organized. Every week the verger and Rev. Eberhard Schwarz go through the plans for the following days – and the lists of tasks often fills several pages. Without the support of Rev. Schwarz and lay workers in the congregation Gnany would have had a hard time coping with all the tasks: What is the procedure for a Protestant service in Württemberg? What bells have to ring and when? And then all the technical equipment. “When I tried out the lighting system for the first time I ran into the church after every press of the button to see what the effect had been,” he remembers with a smile. Church terminology was also difficult for Gnany. What is an ambo*? What is a gallery? When I tried out the lighting system for the first time I ran into the church after every press of the button to see what the effect had been. — Adam Gnany, verger at the Hospitalkirche, remembers with a smile. The young Iraqi found it comforting that some people in Germany were not familiar with these words either and his fellow students had to ask questions when they, too, were attending a training course for vergers. 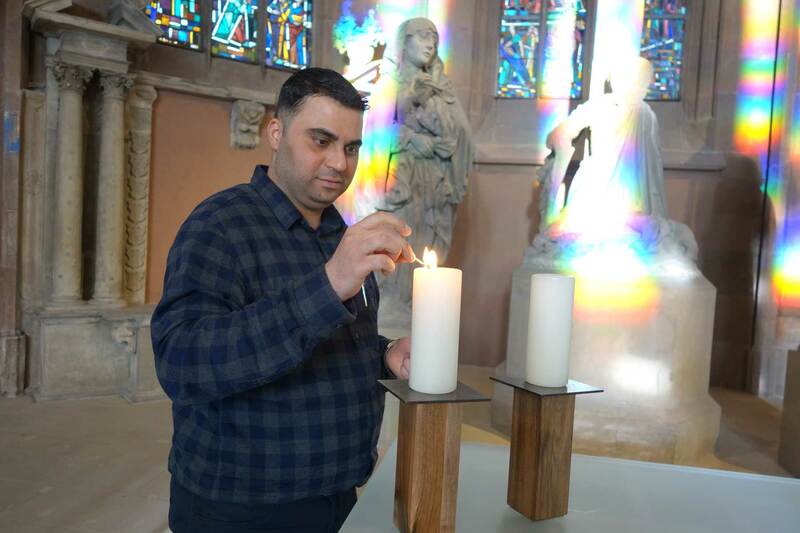 Gnany has twice been to the church conference center in Bad Urach to undergo further training for his new job. At the five-day basic course and a four-day advanced course run by the Wurttemberg association of Protestant vergers the students learn practical skills for their work, such as how to handle artwork in a church or heat the church building efficiently. In addition, they are taught basic biblical knowledge and church history. Gnany appreciates the contact with his colleagues. “We have even set up a WhatsApp group,” he reports. Yet even if Gnany now feels at home in Stuttgart, he is sometimes overwhelmed by homesickness – despite the daily emails from his relatives or short chats online. “I haven’t seen my mother for over two years,” he says. “I would love to meet up with her.” He is saving money to undertake the trip. “I have a safe residence permit for Germany and a passport. Perhaps we could meet in Turkey,” Gnany thinks. At present he alleviates his homesickness by attending services of the Arabic-speaking and Iraqi communities in Stuttgart. He also climbs the church tower. “The steps are like a fitness program,” he says and climbs up the bare concrete steps to the six bells. He can always only wait for a few minutes because every quarter of an hour the clock chimes with deafening effect. However, twice a year Gnany stays up there longer. Then he takes ear plugs and a telescopic broom to sweep down the bells. This is cleaning week in the church tower. By Ute Dilg, ELKWUE-Communications, Stuttgart. Edited by LWF communications.